Yesterday was the best day of cloud surfing I've ever seen at Makapuu. We've flown days like this before, where a thin layer of wispy clouds forms below the ridgeline and streams up and over the ridge, but this time the clouds were thick and massive like real cumulus clouds. 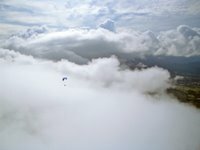 It's hard to describe the feeling of floating high over a vast swirling cloudbank that obscures the entire ridge. So instead I'll just let my pictures do the talking. I only had my old camera with me but it was better than nothing. I should note that I often use photoshop to adjust the lighting, contrast and colors (and sometimes cropping/framing) of my shots. I made a lot of adjustments to bring out a little contrast in these cloud shots because otherwise it was all kind of a misty washed out blur. But I think this made the coloring on some of the shots a little too intense. Let me know if you notice what I'm talking about. I'm still working on my digital editing techniques! There was one that finally showed the colors of my glider the way I like them, with the turquoise popping out in front of the purple. Perhaps I owe that to Photoshop. I wish I was turned a little more toward you on that one. Then there's another where the leading edge blue looks like bland pale blue.